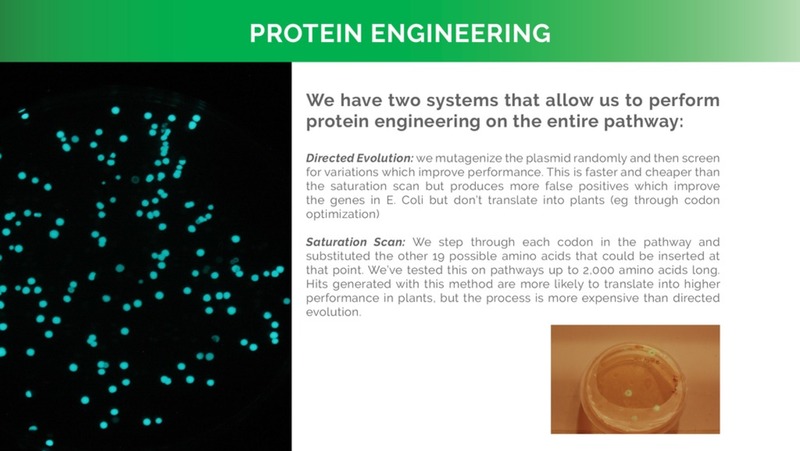 We enable cheaper, faster, and better genetic engineering of plants. 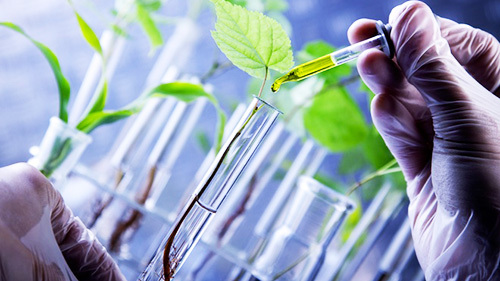 We offer our platform both as a service to other companies and use it internally to develop our own engineered plants. We make money from platform access service fees and from royalties on the sale of the final products. Our first product is a Glowing Plant, which was the first Kickstarter for a synthetic biology application earning us over $600k in pre-orders. 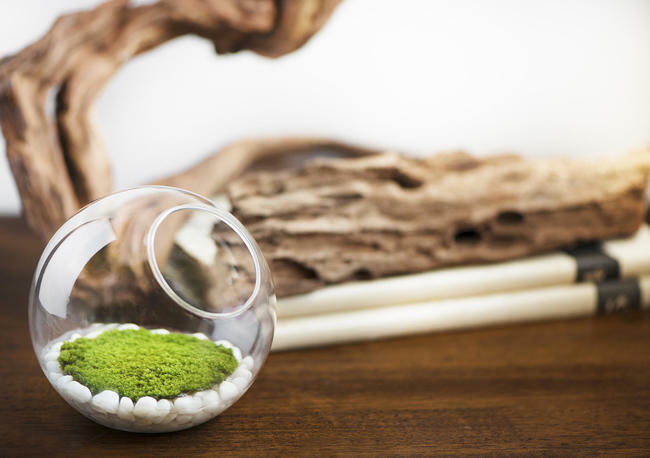 We are also close to shipping a Fragrant Moss. 1 Over $600k in pre-orders for Glowing Plant. 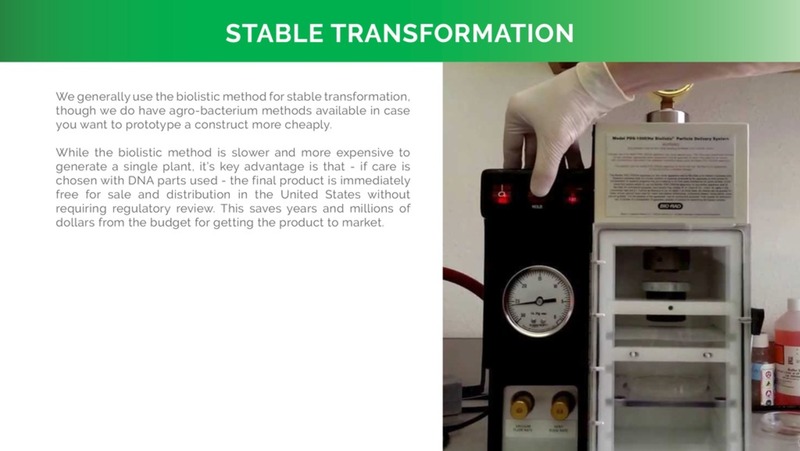 2 Shipped first ever kit which allows anyone to genetically engineer a plant at home. 3 Shipped Fluc v1 of Glowing plant, the lowest cost GE plant ever sold commercially, demonstrating clear regulatory pathways and working technology. 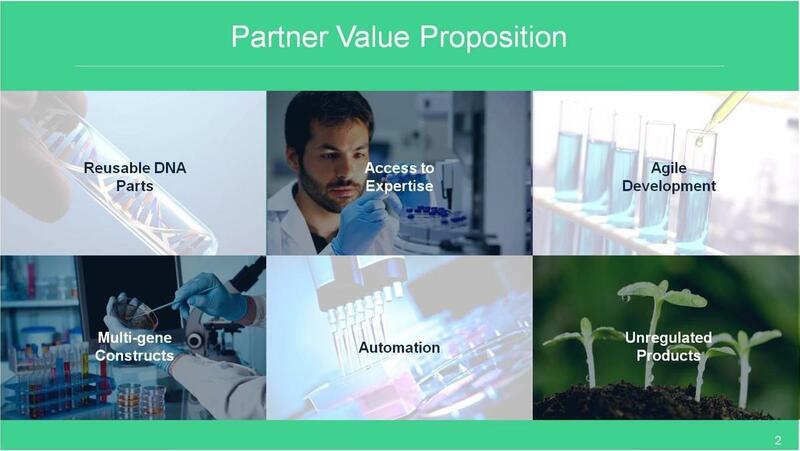 4 Validated demand for TAXA platform by signing 3 collaborative research agreements with partner companies (more in pipeline). 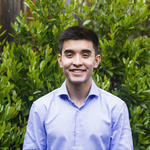 5 First biotech investment by Y Combinator. The glowing plant might look like a novelty, but it turns out that the next big thing always gets dismissed initially as a toy. There’s a long history of interesting companies being born right at the point in time where emerging exponential technologies become accessible to hobbyists, as is happening right now with synthetic biology. The progression is from toys to useful products to industrial mega-applications. Just wanted to say THANK YOU again. I don't know if my students really appreciate how unique and cutting edge this experiment is, but I certainly do. What an amazing opportunity. The COOLEST kickstarter campaign ever! It's paradoxical that we don't yet have this... biology is very energy efficient and energy packets are more dense than batteries. Even a weakly glowing flower would be a great icon. Twice a year we invest a small amount of money ($120k) in a large number of startups (most recently 107). Co-founder of KongZhong (listed on NASDAQ). Prior VP and CTO of Sohu.com and Co-founder of ChinaRen. Micro venture capital that does Seed Investments. Previous investments in Cruise, Mailgun, Leadgenius, Meta. Director at Uber. Founded Mercantila (acquired by Google) and Google Shopping Express. 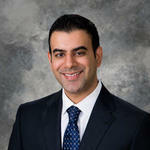 Business Architect, Entrepreneur, Angel Investor and Family man. 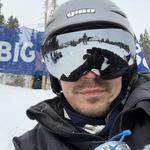 Marketing Manager for RealtyShares, the leading online marketplace for real estate investing. We launched The Glowing Plant in 2013 as the first synthetic biology campaign ever on Kickstarter. People loved it. We raised $484,000—over 700x our original goal. It was the first step in getting bioengineering projects in the hands of everyday people. Our platform is specifically designed to enable anyone to engineer plants for consumer applications. We've built a robust system, including automated machinery, that allows us to insert and optimize new genetic pathways in plants. The first person to create a truly knockout consumer product, will become the market leader. We'll win the market by creating that first knockout product. This will generate cash flow to be reinvested back into our infrastructure. We'll always be one step ahead. Genetic engineering is among the most powerful technologies the human race has ever created, so everyone should have access to it. When powerful technologies are only available to those with power, they get used in ways the masses don't want. Our goal is to put biotechnology in the hands of everyone, starting at the consumer level, this will enable a shift to a circular economy where resources are not dug from finite supplies in the ground but produced sustainably, without CO2, when needed. What is your company making? What's novel about that? 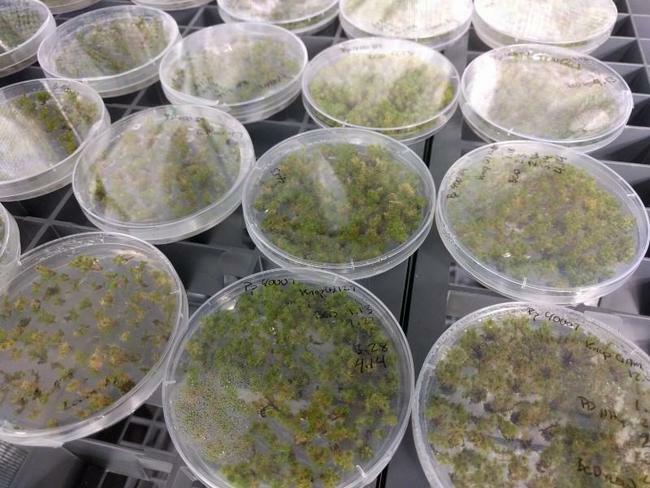 We have built a platform to enable cheaper, faster, and better genetic engineering of plants. We develop new plants with new characteristics, grow them, and sell them to consumers. We have already created two such products, a Glow in the Dark Plant and a Fragrant Moss. Using the platform, skillset and knowledge we have amassed, we intend to make many more. As a company we generate revenues from two sources; we offer the platform as a paid service to other companies, earning royalties on the final product, and we also develop our own genetically engineered plants which we sell direct to consumers. We think we are the first company to open up plant engineering to other companies in this way. We have two products that are close to being market ready. The first is our Glow in the Dark plant, which was the first ever Kickstarter campaign for a synthetic biology product, raising over $600,000 dollars in pre-orders. We have shipped an early version to a small number of early backers, demonstrating regulatory pathways and end-to-end working technology. We continue to work on improving the luminosity of the plant before shipping to others. The second is a Fragrant Moss that we’ve engineered as a replacement to chemical air fresheners. What kinds of products are you engineering? We have two products that are close to being market ready. The first is our Glow in the Dark plant, which was the first ever Kickstarter campaign for a synthetic biology product, raising over $600,000 dollars in pre-orders. We have shipped an early version to a small number of early backers, demonstrating regulatory pathways and end-to-end working technology. We continue to work on improving the luminosity of the plant before shipping to others. The second is a Fragrant Moss that we’ve engineered as a replacement to chemical air fresheners. The first version of the moss smells of Patchouli but we plan on expanding the range of flavors so that there's something for everyone. The core way that we make money is by making engineered organisms that we sell to people, for example the Glow in the Dark plant and Fragment Moss. The business model is simple. 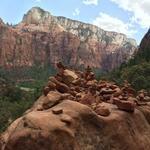 We spend time developing products people want, grow them in large quantities and sell them. As I mentioned in an earlier question, the margins on these, once you’ve made the organism, are very, very attractive. The development is complex, time consuming and there’s a pretty upfront hefty cost associated with the science and testing, but once they are developed the cost of growing them is low and the products are cash cows, not unlike the development of new drugs, only without the level of regulation. As a company, we have absorbed the upfront costs in a couple of different ways. We have 4 different products in development now, and each of them were funded in slightly different ways. The Glowing Plant is the one we’re most famous for. That was funded through pre-orders and has provided upfront market validation both that people want this product, and more importantly that they are willing to pay for it. We’ve been using the money from those pre-orders to develop the plant. 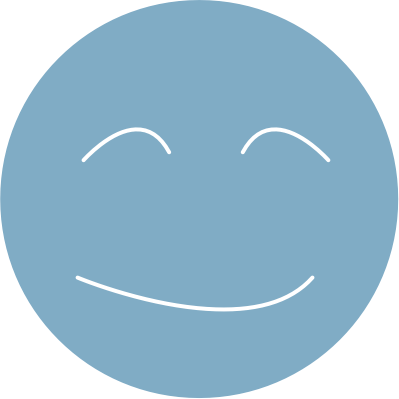 A second funding model has been used with the blue rose that we’re developing. In this case, we have entered into a partnership with a spin-out from the University of Southern Illinois. Our partner has developed a novel blue pathway, i.e. a new way of making blue in cells. The partner has shown that it works in E.coli, and has patents around that, owned by the University of Southern Illinois. The university has licensed those patents to a small startup that has its own investors. That startup, in turn, has been paying us to express that blue pathway in plants, and see if it works in plants. 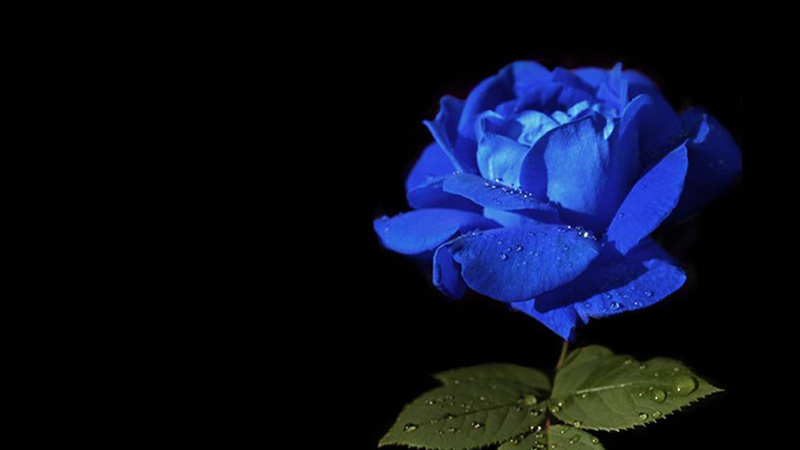 If it does, then the idea is that we can make a truly blue rose, and potentially other types of plants as well, like a blue carnation, and maybe even cotton, so you wouldn’t have to dye cotton. You could have cotton that’s already a nice blue color. In that case, there’s a company that feels comfortable with the market potential of a blue rose: There’s a genetically engineered purple rose that’s been marketed as a blue rose in Japan that sells for up to $20 a stem. They’ve sold ten’s millions of those. I think there’s a pretty exciting potential for that product, if the pathway works in the plants. In that case, that company is paying us to develop that product at cost and then we have a revenue share model where we split the upside 50-50. Why now? What trends do you see to make this the right time to build this company? There are a number of trends coming together to make this the right time to build this company: 1. 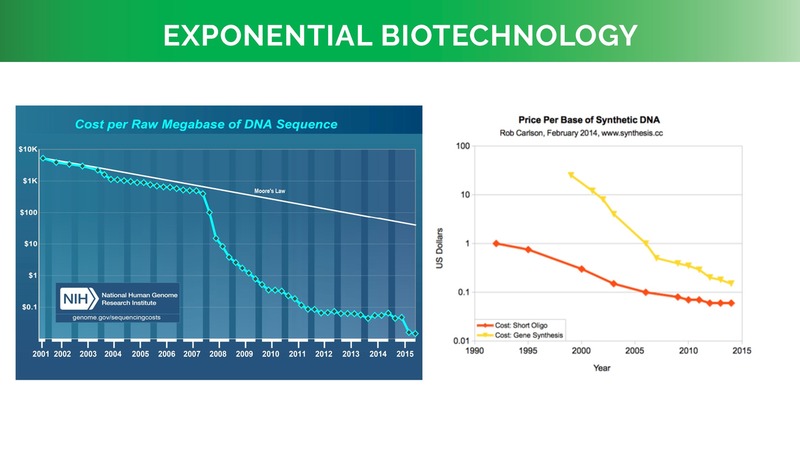 The cost of reading DNA is getting cheaper by the day2. The cost of writing it is falling nearly as fast3. Automation and custom robotics are enabling us to run more experiments, quicker and cheaper4. People’s attitudes towards GE products are beginning to shift as improved knowledge and understanding start to overcome fear It’s affordable, it’s quick, and people have already shown they want what we have to sell. We have already demonstrated the potential of what we can do, and with these market forces in place, the possibilities going forward are literally endless. Genetic engineering has long been an expensive and slow process, available only to the largest corporations and best laboratories. We stand on the cusp of the creation of streams of new products, and we have already shown that we can achieve this, in our very own lab, and at a fraction of the cost. We provide further detail below. There is a phenomenal transition underway in the kind of technology needed to make our products. This is being driven principally by two key advances in our ability to read and write DNA. 1. DNA sequencing, i.e. reading DNA from wild organisms, is experiencing a very, very rapid fall in cost. It is falling about 7 times faster than Moores law, leading to an explosion in our understanding of the underlying genetic pathways that govern all life form. The more we understand, the more we’re able to design new pathways. 2. DNA synthesis, i.e. writing those novel genetic pathways, is falling in cost a little less quickly but still three times faster than Moore's law. It’s all very well to read DNA, but you also want to be able to write it in order to be able to create organisms that can do new and wonderful things. Today, DNA is cheaper to understand, and it is cheaper to create. There is a third key technology that really powers what we do, which is the rise of automation and custom robotics. The lab is transitioning to a world in which scientists don’t have to do everything at a lab bench, but they’re able to program robots to do it which obviously allows you to do many more experiments much more cheaply, much more reproducibly. This adds fuel to the fire because now a highly trained scientist, with a Phd from Harvard or UC Berkeley, can use the knowledge they spent 10 or 20 years developing in school to write code that allows someone with much less experience to run those protocols. Finally, we also see a softening in attitudes and resistance to GE products. There has historically been a massive disconnect between scientific consensus on safety of GE organisms and public perception. We do not think that disconnect is sustainable into the future, and the support for our initial products bears this out. Being at the forefront of the industry as these public perceptions begin to change is a huge opportunity. With all the potential of this technology, why start with consumer products? There are a couple of important things to recognize about consumer products. The first is that these products have wonderful margins once they’re made. We sell our Glowing Plants online for $50, we can ship and package the seeds for under a dollar. This shows you the amount of cash that we will be able to generate once we have a plant bright enough to meet demand. We see a nice path to building a very strong cash flow from filling these early consumer products, which we can then reinvest back into our platform, allowing us to develop more complex, sophisticated products over time. The second thing that consumer products do that is really important to us, is that we are able to combat some of the historical and misplaced resistance that people have about GMO. A lot of this resistance with GMOs has come from the fact that they’re being done by these huge mega corporations who perhaps don’t care about the interests of the environment, and aren’t using the technology in way people like. There are a lot of different applications for this technology. We think that by putting genetically engineered organisms into peoples’ homes, we will be able to change the way that they think about them and change the public perception of those organisms, which should encourage greater adoption of this technology over time. The way I think about this has been really inspired by one of our customers. I had a lady come up to me in a conference and tell me that she had a daughter who is 17 years old and trying to work out what she should be majoring in in college. She wasn’t sure whether she wanted a scientific analytical career, or a creative one. She saw our products and she realized that science could be creative – that the dichotomy in choice was a false one. That’s the kind of change that we see happening when you get broader adoption of technology like this directly into peoples’ homes. It becomes a tangible thing that they have a real physical relationship with. Not something that’s abstract and scary that they only read about in the press. That’s another cool outcome of what we’re doing, and why we think it’s important to start working on consumer products. But we can take this further. If you look at this history of powerful technologies, and genetic engineering may be the most powerful we've ever developed, they have a history of being controlled by groups which already have power. Then it gets used in ways people don't want and further exacerbates existing issues. I think this fear lies underneath resistance to GE crops. The solution is for these technologies to become what we would call democratized. That's a word that often gets misused: The way we use it, it means the tools have to be used by everyday people. The creativity of the internet is such a good example of what happens if you get that right. So for us, it’s super important that we push that technology down to make it available to everyone, so the benefits of it can be accrued to everyone, not just trapped in complicated business models like using it to sell chemicals instead of actually focusing on the benefits that can be created with that technology. The big companies in this space, they like these regulatory barriers, because it stops other people from doing stuff and it protects their own interest. That’s not good for us, or for society.That's the driving philosophy behind our maker kit (and also the way we are funding the company!). The kit is all the ingredients you need to make a genetically engineered plant at home. We ship you agrobacterium, DNA and a few other reagents. Agrobacterium is this very clever little bacterium that, in the wild, has figured out a way to do genetic engineering of plants. In the wild, agrobacterium sticks in a gene into the plant that says, “Make me bacteria food.” Then the plant starts making bacteria food. Sometime in the 1980s scientists realized that they could hijack this process, and instead of the bacteria telling the plant to make bacteria food, we could tell the plant to make something else, and express a gene that we found elsewhere. So this is pretty old technology. What we’ve done is repurposed that technology and packaged it in a way that you don’t need any specialized lab equipment to use it. In fact, the way that this particular plant can be engineered, you merely dip the flowers of the plant in the solution of the bacteria and then the bacteria will insert new genes into the newly formed seed. We are very excited about this kit, which is shipping in early beta. One of our beta testers is a high school teacher out on the East Coast and he's been using it with his students so we might just have enabled the youngest people ever to genetically engineer a plant which is great. How do you address criticisms of GMOs? If you look at the history of powerful technologies, and genetic engineering may be the most powerful we've ever developed, they have a history of being controlled by groups which already have power. Then it gets used in ways people don't want and further exacerbates existing issues. I think this fear lies underneath resistance to GE crops. The solution is for these technologies to become what I would call democratized. That's a word that often gets misused: The way I use it, it means the tools have to be used by everyday people. The creativity of the internet is such a good example of what happens if you get that right. So for us, it’s super important that we push that technology down to make it available to everyone, so the benefits of it can be accrued to everyone, not just trapped in complicated business models like using it to sell chemicals instead of actually focusing on the benefits that can be created with that technology. The big companies in this space, they like these regulatory barriers, because it stops other people from doing stuff and it protects their own interest. That’s not good for us, or for society. That's the driving philosophy behind our "maker kit". The kit is all the ingredients you need to make a genetically engineered plant at home. The kit uses a pretty old technology, but we've repurposed that technology and packaged it in a way that you don’t need any specialized lab equipment to use it. In fact, the way that this particular plant can be engineered, you merely dip the flowers of the plant in the solution of the bacteria, and then, the bacteria will insert it into the newly formed seed. We are very excited about this kit, which is shipping in early beta. One of our beta testers is a high school teacher out on the East Coast and he's been using it with his students so we might just have enabled the youngest people ever to genetically engineer a plant which is great. Tell us more about your kit. The kit is all the ingredients you need to make a genetically engineered plant at home. We ship you agrobacterium, DNA and a few other reagents. Agrobacterium is this very clever little bacterium that, in the wild, has figured out a way to do genetic engineering of plants. In the wild, agrobacterium sticks in a gene into the plant that says, “Make me bacteria food.” Then the plant starts making bacteria food. Sometime in the 1980s scientists realized that they could hijack this process, and instead of the bacteria telling the plant to make bacteria food, we could tell the plant to make something else, and express a gene that we found elsewhere. So this is pretty old technology. What we’ve done is repurposed that technology and packaged it in a way that you don’t need any specialized lab equipment to use it. In fact, the way that this particular plant can be engineered, you merely dip the flowers of the plant in the solution of the bacteria and then the bacteria will insert new genes into the newly formed seed. We are very excited about this kit, which is shipping in early beta. One of our beta testers is a high school teacher out on the East Coast and he's been using it with his students so we might just have enabled the youngest people ever to genetically engineer a plant which is great. Walk us step-by-step through the user experience of the kit. The first step is the permit process. Because the bacteria is regulated, you must have permission from the USDA to receive this. When they get that approved, we send them a box in the mail, which includes the bacteria, some seeds, the reagents, gloves, and the pipes to mix the different chemicals. The first step is to introduce the glowing genes into the bacteria that will be transferring the DNA into the plant. This involves something called 'Cold Snap Transformation' which requires cooling the bacteria down to -109.3°F (or-78.5°C) using dry ice and then rapidly heating it to 86°F (or 30°C). In parallel you plant the seeds and grow them until they’re ready for flowering. You then introduce the agrobacterium to the plant using the dropper, allow those flowers to grow up to seed, and when you plant those seeds, a small number will contain the gene you’re interested in. What we also include is an herbicide resistance marker. If you plant them with herbicide resistance, the plants that have the gene will grow, the rest will die. Voila. You have your plant with your target gene. What is the business model in the short term? We make money by making the engineered organism we sell to people. The margins once you’ve made the organism, are very attractive. We have 4 different products in development now, and each of them were funded in slightly different ways. The glowing plant was funded through pre-orders, and now we’re validated. 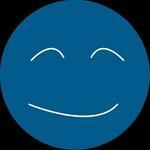 A second example is the blue rose we’re developing. This a partnership with a spin out from the University of Southern Illinois. There’s a researcher there who has developed a new way to make blue in cells. 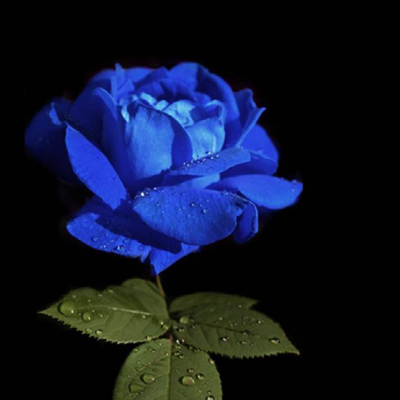 The idea is we can make a truly blue rose, and potentially, other types of plants as well, like cotton that’s already a nice blue color and doesn’t need to be dyed. There are companies willing to pay us to develop that. 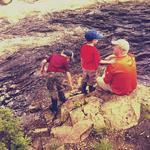 We have a 50/50 share of the proceeds on the downstream. The way we think about the market is a series of layers, a bit like an onion. Each of those layers is a market segment and if we win that segment then we'll be able to expand out to target the next, larger segment. A growth strategy where you dominate a small initial market and then use that market power to expand into a larger segment has been key to many other startup companies’ success. 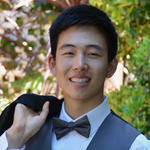 Facebook is the canonical example – they started with Harvard Students (a tiny market! 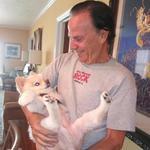 ), then expanded to colleges, then international and finally opened up to everyone. 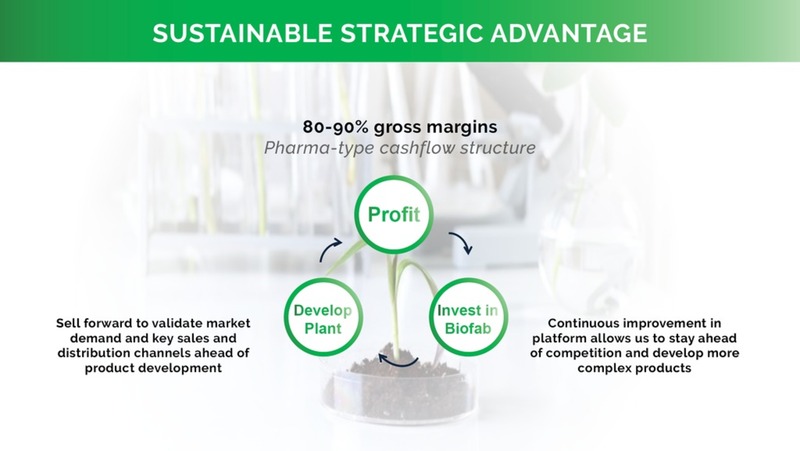 This is a much better strategy than going directly after the largest market first, which is what a lot of the first generation synthetic biology companies did with biofuels (eg Amyris, Solazyme). Big markets are often very efficient and commoditized which aren't features which are easy for startup companies to compete on: it's better to attack them from an existing, dominant, secure market position. The seed in the middle of our onion is our Glowing Plant. We honestly don't really know what the market size is for Glowing Plants, and a lot will depend on how bright we can ultimately make it – but it's certainly not large enough to justify the market valuation we'd like to grow into. The first layer then consists of consumer products like our Fragrant Moss or Blue Rose. US consumers spend $5.6BN on home fragrances and $28BN at florists and we have a number of other planned consumer products in the pipeline. We think we can build a substantial, multi-billion dollar business based on these consumer products – one day, in the same way every desk now has a PC, every home will have a number GE plants producing fragrance, cleaning the air and other yet to be identified applications. Once we've cracked consumer products, which will take many years, we'll have the opportunity to enter the agricultural sector. Plants contribute trillions of dollars to the global economy but less than 14% of those have been engineered so far leaving a 'long tail' of currently unaddressed opportunities. The final layer are the energy and industrial chemical markets. Fossil fuels are stored photosynthetic energy buried in the ground. It should be possible to use plants to make fuels and chemicals directly from today's sunlight, enabling a carbon neutral economy. Because of land and water resource constraints this is going to require the development of salt tolerant plants that can be grown on oceanic floating fields. After the upfront investment in making the first plant, scaling and growth is almost free, due to the fact that our plants are self-reproducing. Gross margins of over 90% enable virtual goods type marketing techniques. Therefore, we are fundamentally a web marketing company and not just a biotech company. And as we showed with our initial Kickstarter and hopefully this equity crowdfunding campaign we have the skills to execute that. 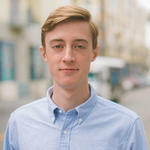 In addition, because we hacked a regulatory path that allows us to distribute our plants without regulatory review we can apply continuous improvement/agile development processes to our plants, releasing early and using the profits from ongoing sales to rapidly improve the product and leave competition in the dust. 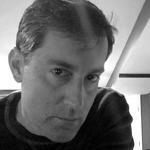 Who are your competitors and why do you have the upper hand? There are really big economies of scale in this industry, and that will allow capital to compete to get big fast. What we believe is that the first person to create a truly knockout consumer product, will become the market leader in that. The way we hope and anticipate that this market evolves, is by winning that first product we’ll generate sufficient free cash flow we can reinvest back into infrastructure we’re building in a way that nobody else can. The parallel here is with the semiconductor industry. Once you’re able to build the next generation of the foundry, you’re able to create all these products others can’t, because they haven’t got the technological sophistication to. If you have that next generation foundry, you are able to build the next generation of products 2 years before anyone else can. You capture the lion’s share of that wave of product category, that gives you the ability to reinvest back into your underlying technology infrastructure, which allows you to stay ahead. How will you develop a long-term, sustainable competitive advantage? There is an extremely high level of technical sophistication to the products we are developing. This is not easy, nor is it easy to reproduce. Engineering plants is also a slow process as it requires growing multiple generations to refine the sequences and create a saleable product. Even with the best skilled employees this takes time to imitate. 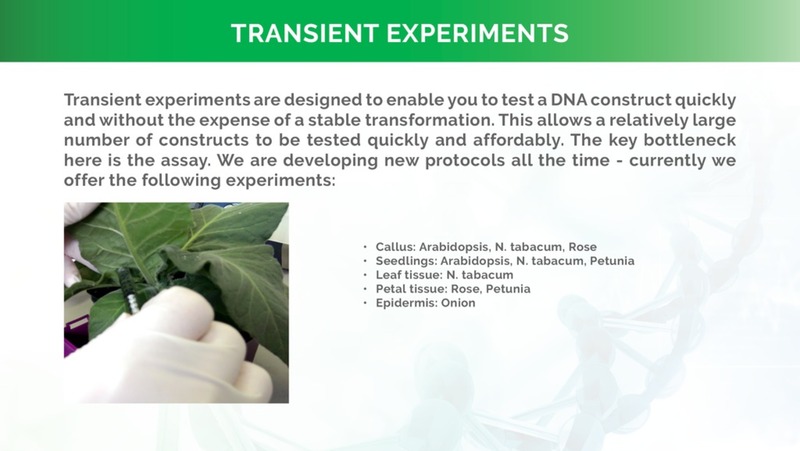 To put this in perspective, what we have been doing with the Glowing Plant in particular is actually super, super interesting on a technical level: we’re trying to put six different genes into a plant, and optimize that pathway. This is ground breaking work and a level of sophistication that other companies simply aren't focusing in on. 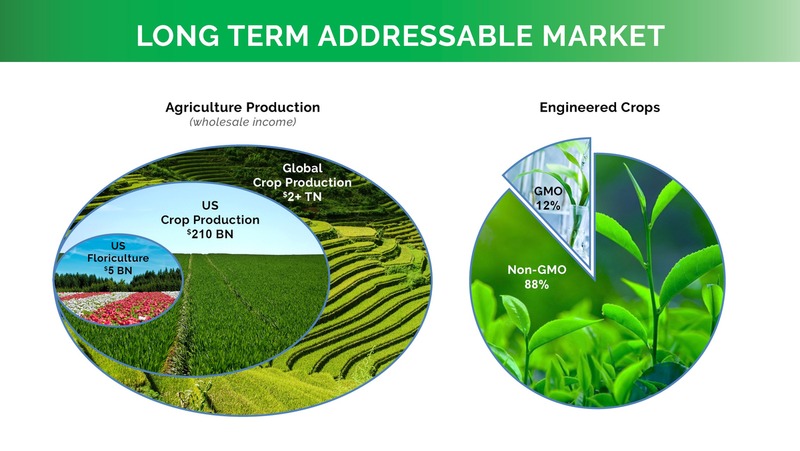 If you look at all the genome crops on the market, they’re basically single genes, and they do this thing called 'stacking' where they then crossbreed but basically all the functionality is coming from a single gene. Optimizing a whole pathway is a different challenge. The interesting thing is, we’ve done that. We had to build advances in technology to even make that possible. For example, we’ve had to be able to build a system to assemble six gene constructs. 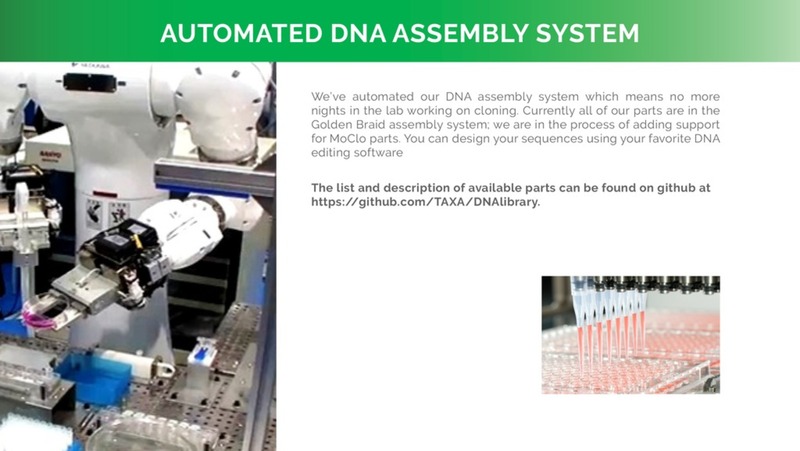 You can buy DNA up to 2,000 base pairs, but we want to put 20,000 or 25,000 into the plant and we wanted to test many more DNA designs in parallel so we had to build tools to automate that assembly – that wasn't something that was commercially available. So we are solving these problems that other people haven’t really focused on yet. That is super-valuable, because if you start solving problems other people haven’t looked at, you create capabilities that other people just don’t have, and will take a long time to catch up with. If we keep making those services available to others through an open platform then they’re better off coming to us, than they are rebuilding and competing. Of course in a market as big as we think this is, that won't be sufficient. There are really big economies of scale in this industry, and that will allow capital to compete to get big fast. What we believe is that the first company to create a truly knockout successful consumer product, will become the market leader. The way we hope and anticipate that this market evolves, is that winning that first product will generate sufficient free cash flow that we’ll then be able to reinvest that back into the platform infrastructure we’re building in a way that nobody else can. The parallel here, I think, is a little bit with a semiconductor industry. Once you’re able to build the next generation of the foundry, you’re able to create all these kind of products that other companies just can’t create, because they haven’t got the technological sophistication to make them. In our case, that means the length and complexity of new genetic pathways going into plants. If you have that next generation foundry, you are then able to build the next generation of products 1-2 years before anyone else can, you then capture the lion’s share of the products coming out of that generations biofoundry, that gives you the ability to reinvest back into your underlying technology infrastructure, which allows you to stay ahead, and maintain that advantage. That’s really how we see competitive advantage arising in this industry. As I said, I think that all comes down to being first to create a really successful consumer organism so that's our key strategic focus for now. The company is dependent upon the retention and addition of high quality employees. Taxa is dependent upon the continued support and involvement of key management, technical, and scientific personnel. Taxa’s success and ability to compete is dependent on its continuing ability to identify, attract, hire, train, retain and motivate highly qualified employees with knowledge of the businesses in which Taxa operates. If any of Taxa’s key personnel were to cease their employment with Taxa, Taxa’s business may be adversely affected. The company's operations could be adversely affected by regulatory change. Changes to Government regulation may reduce the volumes and or values of the products that the company seeks to sell. Taxa’s business is dependent on the company’s ability to sell plants without going through regulatory review. Adverse regulatory change to this would negatively impact our business, prospects, results of operations and financial condition. The development of new products is a complex and lengthy process and may not be completed within anticipated timeframes. 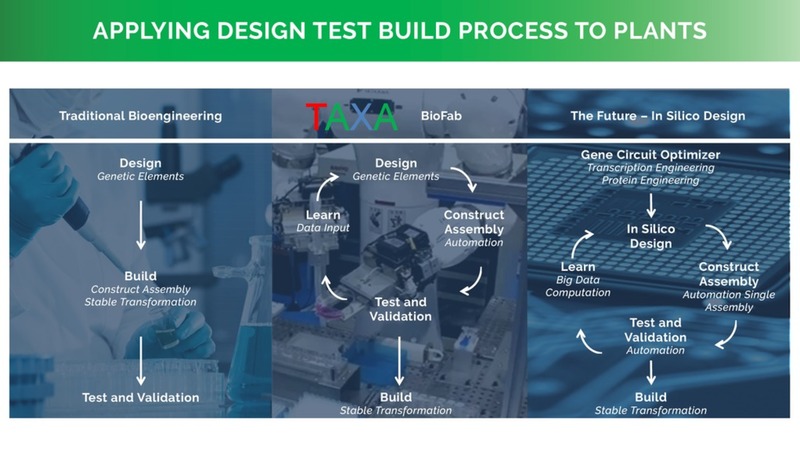 Taxa’s future results of operations depend, to a significant extent, on its ability to develop, manufacture and successfully commercialize new products in a timely manner. The development process is both time consuming and costly and involves a high degree of business risk. For example, Taxa may:-Fail to develop products that are sufficiently exciting to the consumer market. -Fail to develop products that meet desired product characteristics Taxa is dependent on consumer demand for its products. Taxa is dependent on demand for the products it manufactures for its customers and has no control or influence over the market demand for its customers’ products. Demand for its customers’ products can be adversely affected by, among other things, consumer tastes, the emergence of competing products, Government regulation, and reputational issues. If the products Taxa develops do not gain market acceptance, its revenues and profitability will be adversely affected. 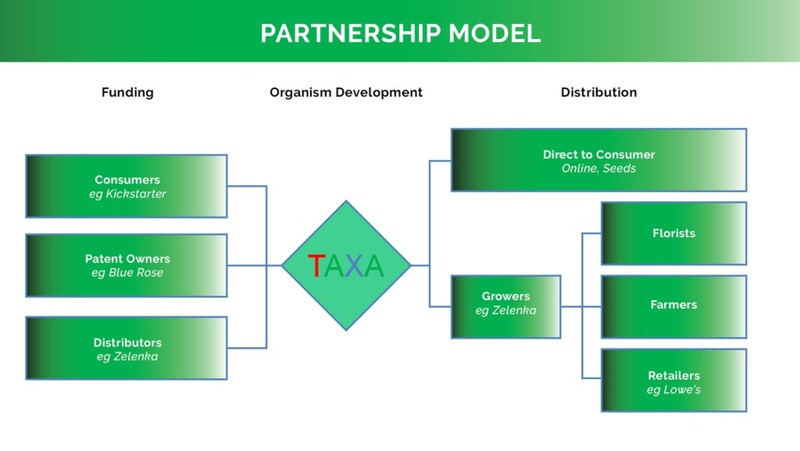 Taxa’s future revenues are dependent upon successful development of products. While biology is becoming easier to engineer, it is still really challenging, and takes a long time. Due to the novelty of our research we regularly encounter unanticipated problems and can reasonably expect to encounter further unanticipated challenges again in the future. The development of the Glowing Plant is behind its original schedule and remains too dim for broad market acceptance. There is a chance we are never able to overcome all the issues and create a viable Glowing Plant that the market will accept. As our products are new to the market, there is a risk that consumers may not seek to purchase them. Failure to develop products of a sufficient quality may impact adversely the company’s business, prospects, results of operations and financial condition. Net Losses and Negative Cash Flow Taxa has recorded net losses in prior years as it has looked to develop its products. While Taxa expects to generate increasing revenues from its products and in the future from it’s the company may not be able to generate a net profit, or if it does generate a net profit, to sustain profitability. The company has invested in its facility, processed and development of products and has required financing to support its operating and investing activities. The company may not generate operating cash flow or may be required to make significant additional investments in its business, either of which could have a Material Adverse Effect. The company operates in a sector where other participants create competition. The company operates in a market that is growing and will attract competition. Competition is driven by proprietary technologies and knowhow, capabilities, consistency of operational performance, quality, price, value, alternative therapies, and speed. Some competitors may have greater financial, research and development, operational and marketing resources than Taxa and be able to bring competing products to market. Greater financial, research and development, operational and marketing resources and experience may allow Taxa’s competitors to respond more quickly with new, alternative or emerging technologies. 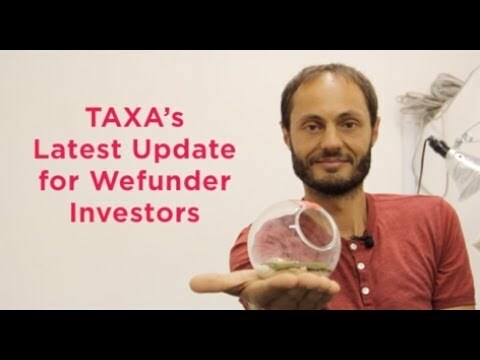 Insufficient Liquidity In the past, Taxa has obtained the cash required for its operations primarily through funding from Kickstarter, Y Combinator and Collaborative Research Agreements. As at May 12th, 2016, prior to the Offering, Taxa has limited liquidity available to fund its business. 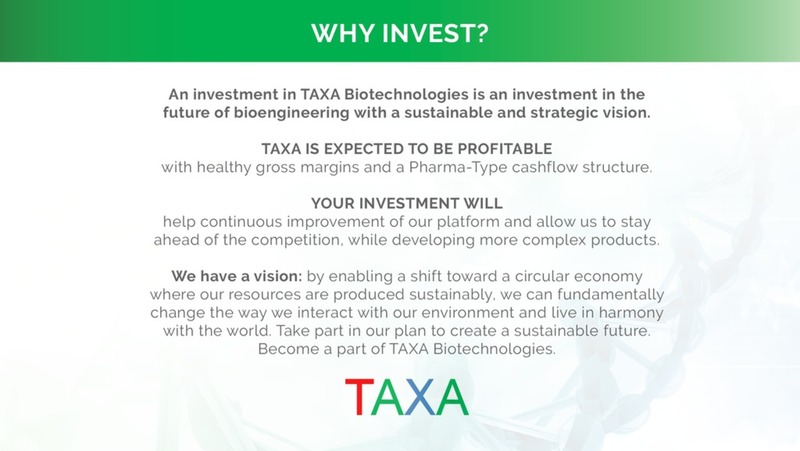 Following the Offering, Taxa may require additional funding for the development and commercialization of its products and to keep pace with the expected business growth. While Taxa may consider funding its business in future through a combination of debt and equity financing, there can be no assurance that such additional financing will be obtained. Trade Marks Taxa will seek to own trade-marks that identify its processes and products. Although Taxa monitors the possible infringement or misuse of its trademarks, it is possible that third parties may infringe upon its intellectual property rights. Any unauthorized use of Taxa’s trademarks could harm its reputation or commercial interests. In addition, Taxa’s enforcement against third-party infringers may be unduly expensive or time-consuming, or the outcome may be an inadequate remedy. Trade Secrets Taxa also relies on trade secrets, including unpatented know-how, technology and other proprietary information, to maintain its competitive position. Taxa seeks to protect these trade secrets, in part, by entering into non-disclosure and confidentiality agreements with parties who have access to them, such as Taxa’s employees, corporate collaborators, outside scientific collaborators, consultants, advisors and other third parties. Despite these efforts, any of these parties may breach the agreements and disclose Taxa’s proprietary information, including its trade secrets, and it may not be able to obtain adequate remedies for such breaches. Enforcing a claim that a party illegally disclosed or misappropriated a trade secret is difficult, expensive and time-consuming, and the outcome is unpredictable. If any of Taxa’s trade secrets were to be lawfully obtained or independently developed by a competitor, it would have no right to prevent such competitor from using that technology or information to compete with Taxa, which could harm Taxa’s competitive position. 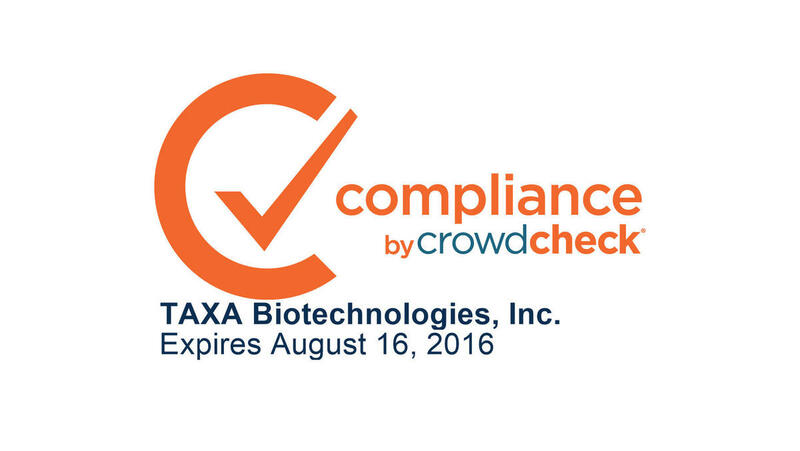 Regulatory Compliance Some of Taxa’s products exist in areas where, due to novelty, there are no legal precedents for interpreting regulations. As a result Taxa may misinterpret regulations which could result in financial or operational penalties. Investment of net proceeds after the offering Taxa will have significant flexibility in applying the net proceeds of the Offering. Investors in Taxa will not have an opportunity to evaluate for themselves the relevant economic, financial and other information regarding any investment or business activity undertaken by Taxa after the Offering. Taxa may pay operating and other expenses from the net proceeds of this Offering. The Corporation’s ability to achieve its investment objectives may be limited to the extent that net proceeds of the Offering, pending full investment, are used to pay expenses rather than to make investments. Furthermore, no assurance can be given that Taxa will be successful in investing the net proceeds of the Offering in investments or activities that will achieve its business objectives. An investment in the Company is speculative and may result in the loss of an investor’s entire investment. Only potential investors who can afford to lose their entire investment should consider an investment in the Company. Tell us about your other team members. 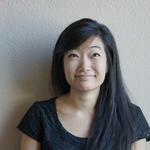 The team has two lead scientists: Dr. Jihyun Moon is a plant biologist who originally comes from South Korea. 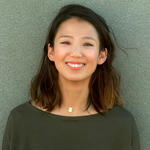 She has a Phd and Post-Doc in plant biology from the University of Berkeley. Dr Jamey Kain who focuses on the microbial side of things. 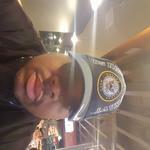 Jamey has a Phd in molecular biology from Harvard University where he also did Post-doc work. 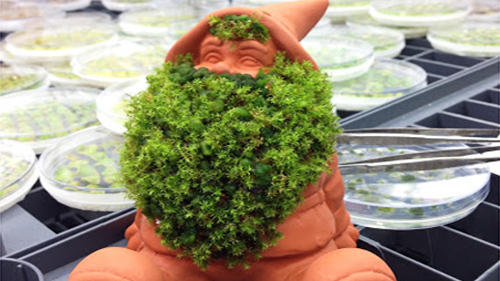 In addition we collaborate with Dr Henrik Simonsen who is a world expert on the bio-engineering of moss. 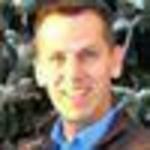 Until recently he was an Associate Professor at the University of Copenhagen. He developed the initial prototype for our Fragrant Moss and we've been working with him to make a version we can sell to consumers. Why is what you're doing so important? What's the grand vision? Genetic engineering is probably among the most powerful technologies that the human race has ever created. And everyone should have access to it. Powerful technologies have to be democratized. They have to become tools that can be used by everyday people, because if they don’t, then that technological power accumulates in places that already have power. It gets used in ways that people don’t want. It’s important we make that tech available to everyone, so the benefits of it can be accrued by everyone. If we get that right then we'll be able to move to our ultimate goal. This is to empower a shift to a circular economy where resources are not dug from finite supplies in the ground but produced sustainably, without CO2, when needed. Biology in general, and photosynthetic plants in particular, are the ultimate sustainable technologies: plants are solar powered factories that take the suns energy and turn it into useful things. Now that we can engineer plants we can control what they make and this has an enormous potential to put us on a much better planetary footing. The key to getting to there is shipping our first high-margin plant to generate the free cashflow to invest in the technology platform to advance towards that goal. That's our focus today. We rely heavily on the pre-sale of our products, and debt and equity financing for working capital. As of December 31, 2016, we had negative working capital of approximately $430,000 and will incur additional costs while developing our products before they are available for sale to the masses. In addition, we have incurred losses since Inception. These matters raise substantial doubt about the Company's ability to continue as a going concern. Throughout 2017, the Company intends to fund its operations with funding from our 2016 Regulation Crowdfunding campaign, additional debt and/or equity financings, and pre-sales/revenues from selling our Fragrant Moss. If we cannot raise additional short term capital, we may consume all of our cash reserved for operations. There are no assurances that management will be able to raise capital on terms acceptable to the Company. If we are unable to obtain sufficient amounts of additional capital, we may be required to reduce the scope of our planned development, which could harm our business, financial condition and operating results. We may also be forced to close the company. The financial statements do not include any adjustments that might result from these uncertainties. 1 The company is dependent upon the retention and addition of high quality employees. Taxa is dependent upon the continued support and involvement of key management, technical, and scientific personnel. Taxa’s success and ability to compete is dependent on its continuing ability to identify, attract, hire, train, retain and motivate highly qualified employees with knowledge of the businesses in which Taxa operates. If any of Taxa’s key personnel were to cease their employment with Taxa, Taxa’s business may be adversely affected. 2 The company's operations could be adversely affected by regulatory change. Changes to Government regulation may reduce the volumes and or values of the products that the company seeks to sell. Taxa’s business is dependent on the company’s ability to sell plants without going through regulatory review. Adverse regulatory change to this would negatively impact our business, prospects, results of operations and financial condition. The day before Trump's inauguration the previous administration published proposals that if implemented would significantly impact our ability to do business. Included in these new regulations were new proposals from USDA regarding the regulation of genetically modified plants, such as the ones we are developing. Some aspects of the new proposals would be good for us, such as deregulating agro-bacteria, which would significantly improve sales of products like our maker kit. They also propose to deregulate a number of regulatory elements, which would increase the strength of promoters available to us. However the new proposals do include one extremely problematic proposal, which is to regulate all GMO plants of the kind we are developing as noxious weeds. Our opinion is that this is an absurd proposal, as by the USDA has stated that none of the hundreds of plants it’s previously reviewed have posed a noxious weed risk, so it is unclear it will pass into law and even if it does we will be requesting that our products are grandfathered in (it won’t come into place immediately). We think this appears to be a politically motivated proposal to appeal to the environmental left so it’s unclear how the current administration will handle it. We are actively engaged in the rulemaking process in order to ensure the relevant officials understand the risks. If implemented however it would have a very severe impact on our business, which would likely result in us folding the company as we would be unable to afford the costs associated with the deregulation process. 3 The development of new products is a complex and lengthy process and may not be completed within anticipated timeframes. 1) Fail to develop products that are sufficiently exciting to the consumer market. 4 Taxa is dependent on consumer demand for its products. Taxa is dependent on demand for the products it manufactures for its customers and has no control or influence over the market demand for its customers’ products. Demand for its customers’ products can be adversely affected by, among other things, consumer tastes, the emergence of competing products, Government regulation, and reputational issues. 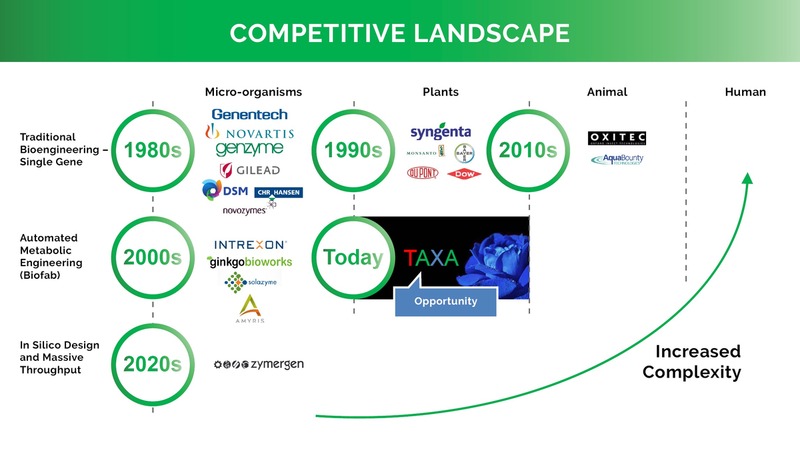 If the products Taxa develops do not gain market acceptance, its revenues and profitability will be adversely affected. 5 Taxa’s future revenues are dependent upon successful development of products. While biology is becoming easier to engineer, it is still really challenging, and takes a long time. Due to the novelty of our research we regularly encounter unanticipated problems and can reasonably expect to encounter further unanticipated challenges again in the future. The development of the Glowing Plant is behind its original schedule and remains too dim for broad market acceptance. There is a chance we are never able to overcome all the issues and create a viable Glowing Plant that the market will accept. As our products are new to the market, there is a risk that consumers may not seek to purchase them. Failure to develop products of a sufficient quality may impact adversely the company’s business, prospects, results of operations and financial condition. Taxa has recorded net losses in prior years as it has looked to develop its products. While Taxa expects to generate increasing revenues from its products in the future the company may not be able to generate a net profit, or if it does generate a net profit, to sustain profitability. The company has invested in its facility, processed and development of products and has required financing to support its operating and investing activities. The company may not generate operating cash flow or may be required to make significant additional investments in its business, either of which could have a Material Adverse Effect. 7 The company operates in a sector where other participants create competition. The company operates in a market that is growing and will attract competition. Competition is driven by proprietary technologies and knowhow, capabilities, consistency of operational performance, quality, price, value, alternative therapies, and speed. Some competitors may have greater financial, research and development, operational and marketing resources than Taxa and be able to bring competing products to market. Greater financial, research and development, operational and marketing resources and experience may allow Taxa’s competitors to respond more quickly with new, alternative or emerging technologies. 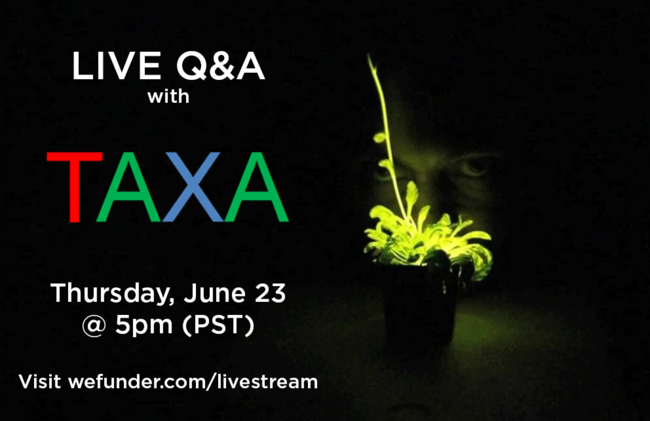 In the past, Taxa has obtained the cash required for its operations primarily through funding from Kickstarter, Y Combinator and Collaborative Research Agreements. As at April 2017 the Company has limited liquidity available to fund its business. Taxa may require additional funding for the development and commercialization of its products and to keep pace with the expected business growth. While Taxa may consider funding its business in future through a combination of debt and equity financing, there can be no assurance that such additional financing will be obtained. Taxa will seek to own trade-marks that identify its processes and products. Although Taxa monitors the possible infringement or misuse of its trademarks, it is possible that third parties may infringe upon its intellectual property rights. Any unauthorized use of Taxa’s trademarks could harm its reputation or commercial interests. In addition, Taxa’s enforcement against third-party infringers may be unduly expensive or time-consuming, or the outcome may be an inadequate remedy. 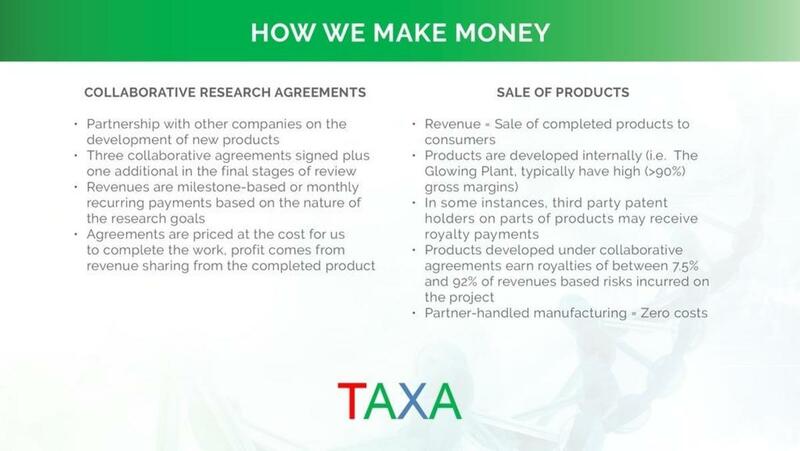 Taxa also relies on trade secrets, including unpatented know-how, technology and other proprietary information, to maintain its competitive position. Taxa seeks to protect these trade secrets, in part, by entering into non-disclosure and confidentiality agreements with parties who have access to them, such as Taxa’s employees, corporate collaborators, outside scientific collaborators, consultants, advisors and other third parties. Despite these efforts, any of these parties may breach the agreements and disclose Taxa’s proprietary information, including its trade secrets, and it may not be able to obtain adequate remedies for such breaches. Enforcing a claim that a party illegally disclosed or misappropriated a trade secret is difficult, expensive and time-consuming, and the outcome is unpredictable. If any of Taxa’s trade secrets were to be lawfully obtained or independently developed by a competitor, it would have no right to prevent such competitor from using that technology or information to compete with Taxa, which could harm Taxa’s competitive position. Some of Taxa’s products exist in areas where, due to novelty, there are no legal precedents for interpreting regulations. As a result Taxa may misinterpret regulations which could result in financial or operational penalties. Taxa will have significant flexibility in applying the net proceeds of the Offering. Investors in Taxa will not have an opportunity to evaluate for themselves the relevant economic, financial and other information regarding any investment or business activity undertaken by Taxa after the Offering. Taxa may pay operating and other expenses from the net proceeds of this Offering. The Corporation’s ability to achieve its investment objectives may be limited to the extent that net proceeds of the Offering, pending full investment, are used to pay expenses rather than to make investments. Furthermore, no assurance can be given that Taxa will be successful in investing the net proceeds of the Offering in investments or activities that will achieve its business objectives. An investment in the Company is speculative and may result in the loss of an investor’s entire investment. Only potential investors who can afford to lose their entire investment should consider an investment in the Company. In April we cancelled the Glowing Plant, for which we have taken nearly $600k in pre-orders. Those backers may demand refunds or enter litigation which would result in bankrupcy. From time to time the company received advances from its Chief Executive Officer for working capital. Such advances were considered short-term and incurred interest rates consistent with Internal Revenue Service minimum, which approximate 3%. In 2015 advances and accrued interest thereon of $1,351 were repaid in full. Interest expense for related party advances was $384 and $383 for the years ended December 31, 2015 and 2014. $200,000 This will allow us to bring Fragrant Moss to market. This will involve growing sufficient volumes of the existing moss strain to ship to initial customers as well as contracting with an outsourced group to produce a custom planter for the moss. This level of investment will also be enough for us to run the initial launch marketing campaign and continue working on existing collaborative research agreements. $400,000 This will allow us to continue R&D required to bring our first two products to market, the glowing plant and fragrant moss. The glowing plant requires work to improve the luminosity and implementation of a new method for doing selection following biolistic transformation with such a large construct. The fragrant moss requires industrial design work to make a high-end planter to grow the moss in peoples homes and requires investment in manufacturing to produce large volumes of the moss for sale. Both products will require investment in marketing, branding and packaging. We will also continue working on other products licensed under collaborative research agreements. $1,000,000 This will allow us to do all of the above activities plus invest in robotics to automate more of our platform as well as hire a business development partner to sign more collaborative research partnerships. With this level of funding we will also commence creation of additional flavors of the fragrant moss. Didn’t catch our LIVE Q&A? Listen to it here. On the strangeness of plants: "These machines, invented more than 400 million years ago, create sugar out of inorganic matter. 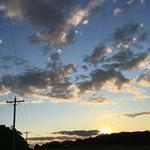 Wondrous machines upon which life depends." We all live today in the most poignant moment in history: the engineering of biology represents the greatest industrial vector that has ever been seen by mankind. These are the kinds of things that help keep students excited about science. As a teacher, I truly appreciate it. I am excited to follow your progress with this. My daughter couldn't decide if she should study a creative career or science in college. Then she saw your Glowing Plant and realized she didn't have to make a choice: science is creative! After his parents go to bed, Sebastian Cocioba usually retires to the third bedroom of the family apartment, where he has built a laboratory. There, amid the whir of climate-controlling fans and equipment harvested from eBay, he is working on what he hopes will one day become a lucrative career. IT LOOKS like an experimental cooking class as participants taste a green powder, pull faces and then mix it into a concoction of fruit and milk. But the event organised by Open Wetlab in Amsterdam has a more serious goal than to come up with new recipes for smoothies: finding ways to make spirulina-an algae which is full of proteins and vitamins, but tastes disgusting-more palatable. Long known for backing software plays, Y Combinator is starting to dip its toes into biotech. In its latest batch is a new synthetic biology startup called Glowing Plant that blew away Kickstarter funding goals last year with plans to engineer - you guessed it - a glow-in-the-dark plant. "No esperes que deslumbre; al principio será como esas pegatinas que teníamos en el techo de la habitación con las constelaciones, un leve resplandor", anuncia Anthony Evans, investigador a cargo del proyecto Glowing Plant, una planta que brilla en la oscuridad. Hunkered down in a converted shipping container stationed in a San Francisco parking lot, three young entrepreneurs are tinkering with the DNA of ordinary plants in the hopes of being able to mass produce a variety that glows in the dark. 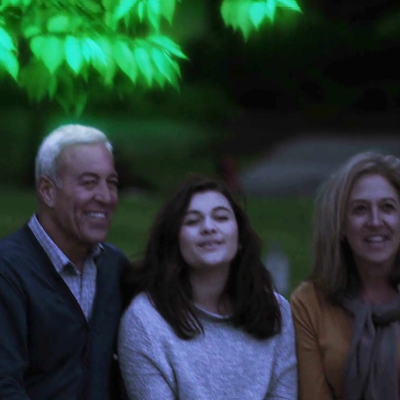 ToyotaVoice: Could Glowing Trees Be The Street Lights Of The Future? What if trees glowed brightly enough to replace street lamps? Whether lit by Fairies in a children's book or special-effects magic in Avatar, the sight of plants glowing in the dark has a special charm. We respond to lighted plants with wonder and joy. 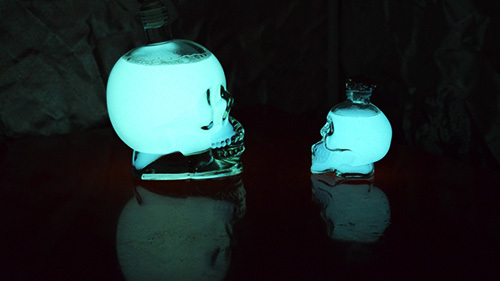 So it's not surprising that a plan to produce glow-in-the-dark plants proved wildly popular on Kickstarter, the crowdfunding website. Today's Supreme Court ruling on the patenting of human genes was a boost to the field of synthetic biology. While human genes cannot be directly patented, the Court found, so-called complementary DNA can. This is DNA that is synthesized from the rNA in a genetic template and then cloned. 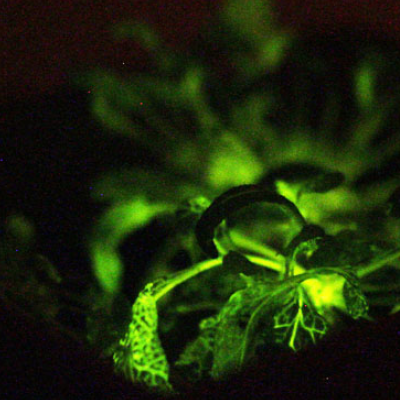 Do glowing house plants take gene tinkering too far? "You can help create the world's first naturally glowing plant... Inspire others to become interested in synthetic biology and receive some awesome rewards in the process." Sound good? If the idea of reading by the light of a plant takes your fancy, you're in good company. Science/AAAS Among the many projects attracting crowd-sourced funding on the Kickstarter website this week are a premium Kobe beef jerky, a keyboard instrument called a wheelharp and a small leafy plant that will be made to glow in the dark using synthetic-biology techniques. Back in 2010 I was a teaching fellow for a group of undergraduates competing in the International Genetically Engineered Machines competition ( iGEM) with a project on "personalized" genetic engineering of plants. We designed genetic modifications that would alter flavor, color, vitamin production, and the presence of allergens, so that a gardener could customize seeds to suit his or her whims and needs. John Brecher / NBC News SEATTLE - Right now it's a storeroom filled to the ceiling with cardboard boxes and cast-off gizmos, but HiveBio's hacker space is being transformed into the latest frontier for a nationwide DIY biotech movement. Fueled by crowdfunding, grants and membership fees, community labs like HiveBio are delving into what's arguably the 21st century's hottest scientific frontier. "I'm walking today in Tel Aviv along a boulevard, and there are huge trees around me, and I'm thinking how beautiful it would be at night if they were faintly glowing." Synthetic biologist Omri Amirav-Drory's musings about a world where we grow our light resources, might not be all that distant. 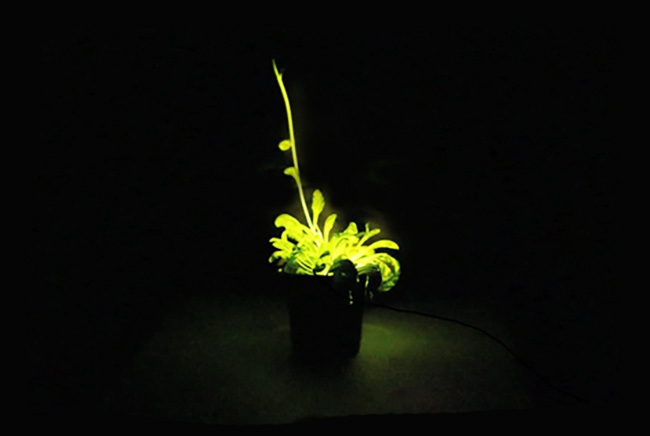 A glowing plant that could provide a sustainable light source has caught the imagination of backers on the crowdfunding website Kickstarter. With a month still to go, the project has raised $243,000 (£157,000). Its initial goal was $65,000. Backers are promised seeds for glowing plants, although delivery will not be until next May at the earliest. Two environmental organizations, Friends of the Earth and the ETC Group, have written to Kickstarter and to the Agriculture Department, which regulates genetically modified crops, in an effort to shut down the glowing plant effort. Thanks for vouching for Antony! If you'd like to invest in Antony, please open an account. We'll waive your fees if you do it now. We asked Antony for 10 personal references. Can you vouch for Antony?